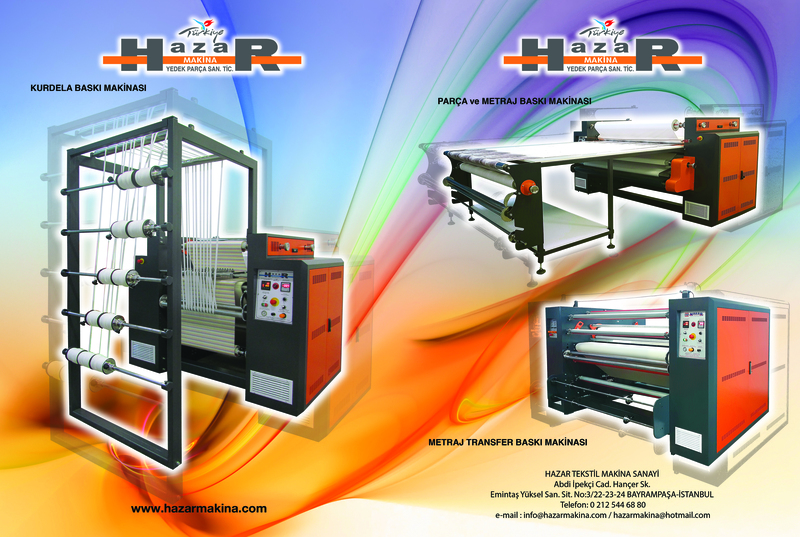 Hazar textile machinery was established in 2005, in İstanbul. Although Hazar Textile Machinery company was established shortly before with its expert staff, high quality and reasonable prices, the company preferred in the machines are assurance to our customers and providing ease of use. Hazar Textile Machinery company gives its products guarantee 2 years ( except for user errors). Customer satisfaction is our basic principle. Of our existence and our competitiveness in the market, advanced techvanced technology, low-cost, high-speed and high-quality believe that it is due to go into production. We believe that our future is due to the ability to satisfy our customers, it is our desire for customers by providing superior quality and service approach will continue and will remain a reliable partner for desing stage, technical and logistical sense, gives professional support to all your projects. In machinery industry, our conpany will to insist quality and service sectors are considered correct at the best price quality it deserves, without causong unfair competition, timely implementation and post implementation will reinforce our service, protuction and produce loving, open to development with a broader perspective, respect for human and environment sector company be.